New Book hot off the press -- The Cross and the Towel: Leading to a Higher Calling by Tony Baron. This is a must-read for the Christian leader. I am not kidding. Tony deals with important issues we all face in Christian leadership and responds with solid Biblical answers. You can get it at Amazon. Tony is a long-time friend. 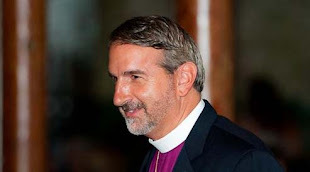 He is an Anglican Priest with AMiA, but serves as President of the Servant Leadership Institute at Datron World Communications in California. Brilliant guy!! Great insight! My son, James, put a video together from our recent Kiteboarding Adventure. If you would like to see what this is all about, check it out at http://www.youtube.com/watch?v=CyV6QQB3F8Q. We are packing up tonight and I realized my passport was gone. Nowhere to be found! James and I retraced all our steps and the last time we saw it was at the front desk six days ago when we checked in and they wanted a copy. They didn't have it. So we went through all our stuff again... and again... and again. We look up the procedure to replace a lost or stolen passport and call the Embassy (3 hours away), and begin the process to get a new passport. The earliest appointment is April 18th. However, they will consider emergency situations -- but will respond within one business day. Our flight leaves in 15 hours. I begin to fill out the online paperwork, go to the front desk to get another copy of their copy (waking the lady out of her bed), and begin to think about my schedule this week and what will happen if I can't fly out tomorrow. I start going through our things a for a fifth time! It then dawns on me to pray out-loud... "Father, if my passport is in this room, please let us find it." James says, "Dad, you haven't prayed, yet?" Within one minute, the thought goes through my mind to look under the lining of suitcase. There it was!! We spent almost two hours of our night in an "almost panic" about the passport. Moral of the story... PRAY FIRST! William Shedd: "A ship in a harbor is safe, but that is not what a ship is built for." We must get out of the harbor, but it is sure helpful to have a harbor to come back to -- for renewal, for supplies, for healing, for mending, for direction, for centering. Time Alone with the Lord every day is a necessary harbor. Time with one's spouse. Time with one's church. But out we must go - out to where the Lord leads in his purpose for our lives. Muriel Strode: "Do not follow where the path may lead. Go, instead where there in no path and leave a trail." Not everyone is a trail blazer. Not everyone can bushwhack through the country side. But for those who can and will, the Lord will lead. Trail-blazing is a walk of faith. Reminds me of Proverbs 3:5,6. No wind today. Cabarete is known for having good wind for 340 days of the year! So what do they do down here when it is not windy?? To bring out the kites. But the wind never came! As a minister I firmly believe that I am not allowed to preach what is not in the Bible. It is an exciting enough book as it stands. No one has a right to adjust the Gospel or revise God's plan for his church. In too many places where the Bible is being thumped and doctrine is being argued until three in the morning, the Spirit of that doctrine is missing. William Law (an Anglican from the 1700's): "Read whatever chapter of Scripture you will, and be ever so delighted with it -- yet it will leave you poor, as empty and unchanged as it found you unless it has turned you wholly over to the Spirit of God, and brought you into full union with and dependence upon him." They didn't arrive until about 4:00 (at least without storms). But when they did, the winds were just enough so that we were able to get in two hours on the water. I worked on kite-control, and James got to work on making runs. Good day in the end! Of course, any day is a good day, especially where we are. Still can't get over how beautiful this part of God's creation is! Since the winds were nowhere to be found for another day, James and I rented a pair of motorcycles and set out to explore the DR countryside. We ended up going on a four-hour ride to the top of a mountain range to a town called El Camito. The trip took us through numerous villages and towns along the way. There we had an incredible lunch in a restaurant overlooking Roco and Santiago. Incredible views. I will have to say the mountain roads were an adventure -- you never knew what was going to come around the next turn from the opposite direction! My bike threw its chain twice. The second time I was putting the chain back on and a man came out of nowhere (his shop was the bottom of the hill). He straightened and tightened the tire. I didn't have anymore problems. Thank you Lord! James outside the restaurant where we stopped. After we returned from our motorcycle adventure, we went to eat at an Irish Pub. It was quite interesting to hear Irish ballads and tunes sung in Spanish! Of course, nothing was mentioned about St. Patrick and his missionary activities, and the spiritual impact he made for Christ. Just worldly, raw tunes about the lives of the Irish. These guys were quite good when they sang in English. Well, it is difficult to kite board without wind. We were able to get in one good day, but since then we have had two days of no wind. The beach sure is pretty though! Reminds me of some churches I have been a part of.... everything is pretty, but no wind (Holy Spirit)! Lord, help us to build churches filled with Your Wind! You can tell how popular a church is by who comes on Sunday morning. You can tell how popular the pastor or evangelist is by who comes on Sunday night. But you can tell how popular Jesus is by who comes to the Prayer Meeting. Prayer is the source of the Christian life, a Christian's lifeline. God is not aloof. He says continually through the centuries, "I'll help you, I really will. When you are ready to throw up your hands -- throw them up to me." Charles Spurgeon: "The best style of prayer is that which cannot be called anything else but a cry." "The atmosphere of my Father's house," Jesus seems to say, "is to be prayer. The aroma around my Father must be that of people opening their hearts in worship and supplication... This is a house for calling on the Lord." "I have seen people do more in people's lives during ten minutes of prayer than in ten of my sermons." God says to us, "Pray, because I have all kinds of things for you; and when you ask, you will receive. I have all grace, and you live with scarcity. Come unto me, all you who labor. Why are you so rushed? Where are you running now? Everything you need, I have." I am headed south to the Dominican Republic with my college-aged son on his Spring Break. We are flying to Puerto Plata and will drive over to Carabete and a place known as Kite Beach. Our plan is to continue to work on our kite boarding and we will be in Kite School all week (our father-son thing for the past two years!). We had a long layover in the Miami Airport, and I was very impressed with the large number of mission teams I saw who were heading to Haiti. Youth groups, college-age young people, and numbers of older adults were either headed to Haiti or coming back from Haiti. As you probably know, Haiti is still riveted from the massive earthquake last year, and there is much need. It was quite inspirational and exciting to see so many folks committed to helping others in need. The scenes and reports from Japan are still heart-breaking and devastating. Let us continue to pray for the people of Japan and those who are attempting to provide aid, food, medical assistance, housing, and most importantly, the Gospel of eternal life in Jesus. For those of us who are able, let us give of our resources to help the numerous Christian ministries attempting to provide aid to devastated people and broken people. Ash Wednesday. A day to remember our mortality -- that we are human; that we are sinners in need of repentance; that we will die. Sounds depressing. Sounds morbid. Sounds awful!! But no. It is because of Jesus Christ and his death and resurrection that all this is changed. "But thanks be to God!! He gives us the victory through our Lord Jesus Christ" (1 Corinthians 15:57). His grace appropriated to us by our faith (Ephesians 2:8,9) changes everything! Let us approach this day with openness to hear from God about the impurities in our lives -- where we need to repent, where we need to allow Him to work on us and in us and through us, and where we need to humble our hearts before Him. Almighty and everlasting God, you hate nothing you have made and forgive the sins of all who are penitent: Create and make in us new and contrite hearts, that we, worthily lamenting our sins and acknowledging our wretchedness, may obtain of you, the God of all mercy, perfect remission and forgiveness; through Jesus Christ our Lord, who lives and reigns with you and the Holy Spirit, one God, forever and forever. Amen.